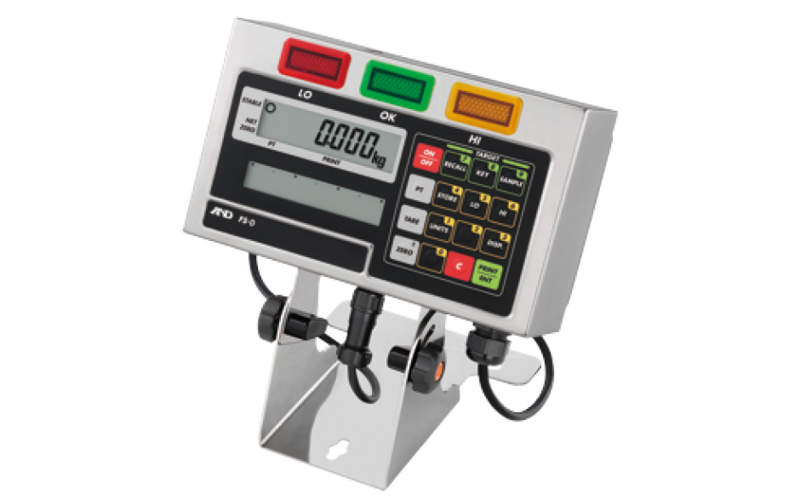 The FS-D indicator is ideal for today’s food processing industry and busy production environments. platforms from A&D Weighing and most manufacturers. The indicator can be used to build platform scales from 6 kg (15 lb) capacity to 1500 kg (3500 lb) capacity. The indicator can drive up to 4 x 350Ω load cells. Three weight display resolutions are available, 1/3,000, 1/6,000 (~1/7,500) and 1/12,000 (~1/15,000) to cover various applications. Weighing units are kg (kilogram), g (gram), lb (pound), oz (ounce), and lb-oz (pound and ounce). However, the FS-D set to a capacity higher than 30 kg (70 lb) does not have all of them. Constructed from stainless steel for harsh working environments. Large liquid crystal display with back lighting and analog sweep display of 60 segments with back lighting. AC power source (100V ~ 240V), and an optional SLA (sealed lead acid) battery is available for operation where AC power is not available. Built in comparator lights with large and bright red, green and yellow LEDs for better visibility. Two modes of comparator operation, Target weight setting and Upper / Lower limits setting. Take-away check weighing with auto-tare function. Optional serial data and comparator relay interface. 9.8 (W) x 8.0 (D) x 10.5 (H) in.